Koduri Srisaila Sri Rajamouli (born 1973), known professionally as S. S. Rajamouli is an Indian film director and screenwriter, known for his works primarily in Telugu cinema. He is known for directing high fantasy works such as Magadheera (2009), Eega (2012), the two part Baahubali: The Beginning (2015) and Baahubali 2: The Conclusion (2017). The Baahubali franchise has achieved the highest grossing Indian multilingual film franchise of all time globally, with a box office of approximately ₹1,900 crore (US$260 million). The first edition, Baahubali: The Beginning was nominated for Saturn Award for Best Fantasy Film, while the second edition, Baahubali 2: The Conclusion received the Saturn Award for Best International Film by the American Academy of Science Fiction, Fantasy and Horror Films. The second edition, garnered the Australian Telstra People's Choice Award at the 2017 Indian Film Festival of Melbourne. His other works include the sports drama film Sye and the social problem film Vikramarkudu, which was screened at the 37th International Film Festival of India in the mainstream section. The melodrama films Maryada Ramanna, Vikramarkudu and Chhatrapati were remade in various Indian languages, with successful reviews. Rajamouli has garnered several awards including three National Film Awards, four Filmfare Awards South, five state Nandi Awards, the IIFA Award, two SIIMA Awards, the Star World India, "Entertainer of The Year" in 2012, and the "CNN-News18 Indian of the Year in Entertainment" for 2015. In 2016, he was honoured with the Padma Shri, India's fourth highest civilian honour for his contributions towards the field of Art. Rajamouli was born on 1973 in Amareshwara Camp near Lingsugur in Raichur District, Karnataka to screenwriter K. V. Vijayendra Prasad and Raja Nandini. His family hails from Kovvur in Andhra Pradesh. His primary education was done at Kovvur and his higher education was at Eluru. He lived in Vizag for several years as his mother was from there. Rajamouli is an atheist. His cousin, M. M. Keeravani, is also in the film industry and works as a music director. He has collaborated with his father on many films such as Baahubali: The Beginning, Eega among others, who wrote the screenplays of these films. As of 2015, he directed 12 movies. Rajamouli started directing Telugu soap operas on Eenadu Television, under the guidance of K. Raghavendra Rao. Later on, he directed Santhi Nivasam TV Serial which was produced by K. Raghavendra Rao. His first shot at Telugu films was Student No.1, with Jr. NTR in 2001. It took two years for Rajamouli to come up with his second movie Simhadri. In the two-year gap between Student No.1 and Simhadri, Rajamouli planned his first mythological film with Malayalam actor Mohanlal, but the film eventually got shelved. In 2015, Assistant art director Manu Jagath, who later worked as the art director for Baahubali, released several sketches he had drawn for the shelved Mohanlal project. Rajamouli's third movie was Sye, with actors Nithin and Genelia D'Souza. It was a first-of-its-kind movie in Tollywood, in that it was based on a rugby game. This movie was also the first instance where Rajamouli collaborated with K. K. Senthil Kumar. His next was Chatrapathi, with the music of M. M. Keeravani and cinematography by Senthil Kumar. In his next stint Vikramarkudu, Rajamouli worked with Ravi Teja. The movie was a big success and was remade into Hindi as Rowdy Rathore by Prabhu Deva, with Akshay Kumar in the lead, into Tamil as Siruthai, and in Kannada as Veera Madakari by ace actor Sudeep. He then directed Yamadonga, a socio-fantasy film praised by critics. Next was the biggest film in Telugu Cinema at the time, Magadheera, starring Ram Charan Teja; Magadheera became one of the biggest commercial successes in Telugu Cinema. He won the Nandi Award for Best Director and Filmfare Award for Best Director – Telugu for the film. This film also won the National Film Award for Best Choreography. His comedy thriller film Maryada Ramanna (2010) was remade in Hindi as Son of Sardar. In one of the popular MAA TV shows, Mee Star, Rajamouli said that Maryada Ramanna is his personal favourite movie among all the movies he has directed. Rajamouli's 2012 experimental fantasy film, Eega was screened to critical acclaim at L'Étrange Film Festival. The Tamil version Naan Ee was screened at the 10th Chennai International Film Festival. The Telugu version has also garnered awards for the Most Original Film, Best Special Effects, Best Comedy, Best Fights, Best Film to Watch with a Crowd, Best Editing, Best Villain and Best Hero at the 8th annual Toronto After Dark Film Festival. The Telugu version was also screened the 2013 Cannes Film Festival, the Panorama section of the 16th Shanghai International Film Festival and Puchon International Fantastic Film Festival. The film has received Best art direction award at the Fantaspoa film festival of Brazil. Also, it has been nominated for six award including Best film, Best Cinematographer, Best Special effects, Best Music Composer, Best Editor and Best supporting Actor for the Madrid International Film Festival. In 2015, he directed Baahubali: The Beginning, which became the second Global highest grossing Indian film of all time, and the highest grossing Indian film of all time within India. The making of the epic film was featured in BBC's documentary on 100 Years of Indian cinema, directed by Sanjeev Bhaskar. The film was shot using Arri Alexa XT camera, marking Rajamouli's first film using digital camera. Rajamouli's work was cited by The Hollywood Reporter, The Guardian and The Huffington Post. The film was Nominated in four categories at the 42nd Saturn Awards of the Academy of Science Fiction, Fantasy and Horror Films in Los Angeles, USA. Baahubali: The Beginning was screened at the Open Cinema Strand of Busan International Film Festival, Indian Film Festival The Hague, Sitges Film Festival in Spain, Utopiales Film Festival in France, Golden Horse Film Festival in Taipei, Taiwan, Tallinn Black Nights Film Festival in Estonia, L'Etrange International Film Festival in Paris, Five Flavours Film Festival in Poland, Hawaii International Film Festival in Honolulu, Brussels International Fantastic Film Festival in Brussels, Belgium, and the Cannes Film Festival. The part II - Baahubali 2: The Conclusion was premiered at the British Film Institute, and was the inaugural feature film at the 39th Moscow International Film Festival. 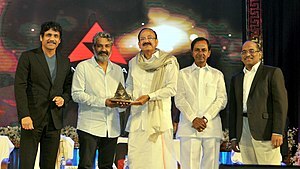 Rajamouli receiving the Akkineni Nageswara Rao National Film Award from Shri M. Venkaiah Naidu. ^ Gallery – Events – Chatrapati 100 Days Function. CineGoer.com. Retrieved on 21 October 2015. ^ a b "Baahubali, Bajrangi Bhaijaan: Meet the Rs 500 crore writer". India Today. 20 July 2015. Retrieved 22 October 2018. ^ "SS Rajamouli's mother Rajanandini died today". Filmibeat.com. 20 October 2012. Retrieved 22 October 2018. ^ a b "SS Rajamouli on Baahubali 2: Sreemukhi is a big fan of Punch Power A.V.S.R Pandu Ranga RaoThe Conclusion, being an atheist and his love for cinema". Firstpost. 27 April 2017. Retrieved 1 May 2017. ^ "Bahubali-2 To Be Screened At British Film Institute". 1 March 2017. ^ a b "Baahubali 2 premiere: Queen Elizabeth II will watch it before anybody else in India?". 28 February 2017. ^ "Bahubali 2 Becomes Highest Grosser Of All Time In Five Days - Box Office India". www.boxofficeindia.com. ^ "Why Business Of Dubbed Tamil Telugu Not Included - Box Office India". www.boxofficeindia.com. ^ "Top GROSS Numbers - Hindi And All Languages - Box Office India". www.boxofficeindia.com. ^ "Is Baahubali 2 a Hindu film? Dissecting religion, folklore, mythology in Rajamouli's epic saga". ^ Dave McNary (27 June 2018). "'Black Panther' Leads Saturn Awards; 'Better Call Saul,' 'Twin Peaks' Top TV Trophies – Variety". Variety.com. Retrieved 9 January 2019. ^ a b "IFFM-Dangal and Baahubali won telestra peoples choice award". ^ "Directorate of Film Festival" (PDF). iffi.nic.in. Archived from the original (PDF) on 15 April 2016. Retrieved 30 January 2018. ^ 'SOS' director wants SS Rajamouli to see his film – The Times of India. Articles.timesofindia.indiatimes.com (17 November 2012). Retrieved on 2015-10-21. ^ "Winner of Indian of the Year 2015 in the Entertainment category: SS Rajamouli". ^ In conversation with S.S.Rajamouli on The Front Row. YouTube. 28 December 2012. ^ "Baahubali director SS Rajamouli to receive Padma Shri Award". ^ "Padma Awards 2016: Rajinikanth, Priyanka Chopra, Ujjwal Nikam, Saina Nehwal, Sania Mirzia, SS Rajamouli and others honoured". International Business Times, India Edition. 25 January 2016. ^ a b c "SS Raja Mouli - Telugu Cinema interview - Telugu film director". www.idlebrain.com. ^ Ganguly, Nivedita (13 May 2017). "Vizag holds a special place in my heart: Rajamouli" – via www.thehindu.com. ^ Years back S.S Rajamouli planned a movie with Mohanlal – Malayalam Movie News. Indiaglitz.com (25 July 2015). Retrieved on 21 October 2015. ^ Mohanlal SS Rajamouli team’s dropped film’s sketches came out from Manu Jagat. Onlookersmedia.in (9 October 2015). Retrieved on 21 October 2015. ^ Son Of Sardar Review. Indicine.com (14 November 2012). Retrieved on 2015-10-21. ^ "57th_National Film Awards" (PDF). Retrieved 28 April 2012. ^ SS Rajamouli about Maryada Ramanna interview – Telugu Cinema interview – Telugu film director. Idlebrain.com (20 July 2010). Retrieved on 21 October 2015. ^ Singh song | Rajeev Masand – movies that matter : from bollywood, hollywood and everywhere else. Rajeevmasand.com (13 November 2012). Retrieved on 21 October 2015. ^ Mee Star : S.S.Rajamouli Part 2. YouTube. 30 July 2012. ^ "L'ETRANGE 2012: Review of EEGA". Quietearth.us. Retrieved 21 October 2012. ^ "Eega Screened at a French Film Festival". chitraloka.com. Retrieved 25 August 2012. ^ "Eega Gains International Recognition". cinemamama.com. Retrieved 21 July 2012. ^ "Rajamouli's Eega to be screened at Chennai Film Festival". 123telugu.com. Retrieved 5 November 2012. ^ "Rajamouli's 'Eega' wins National Awards". 123telugu.com. 18 March 2013. Retrieved 18 March 2013. ^ "Rajamouli's Eega continues to win awards". The Times of India. 3 November 2013. Retrieved 4 November 2013. ^ "SS Rajamouli's Eega to be screened at Cannes, Shanghai film festivals". bollywoodlife.com. 15 May 2013. Retrieved 15 May 2013. ^ "'Makkhi' Review: Revenge comes in all sizes!". Zeenews.india.com. Retrieved 13 October 2012. ^ Eega to be screened at Cannes!. 123telugu.com. Retrieved on 21 October 2015. ^ "Ravinder Reddy Wins Big in Brazil". indiaglitz.com. 10 August 2013. Retrieved 11 August 2013. ^ Shiva Prasad (16 May 2013). "After Cannes; Eega heads to Madrid & Korea". The Times of India. Retrieved 16 May 2013. ^ Cain, Rob (14 August 2015). "Oops... 'PK' Is Not Actually India's Top-Grossing Movie Ever". Forbes. ^ 'Baahubali' Zooms Past 'Dhoom', Now India's All Time #3. Forbes.com (10 August 2015). Retrieved on 2015-10-21. ^ India's most expensive film? | regional movies. Hindustan Times (15 July 2013). Retrieved on 2015-10-21. ^ Rajamouli's Bahubali is India’s costliest film? – The Times of India. Timesofindia.indiatimes.com (13 July 2013). Retrieved on 2015-10-21. ^ "Rajamouli-Prabhas new movie budget". The Times of India. 14 October 2012. Retrieved 23 February 2013. ^ "Baahubali's team gets a rare honour". The Times of India. 21 May 2014. Retrieved 19 July 2014. ^ "Rajamouli's Bahubali finds place in BBC's documentary". The Hans India. 22 May 2014. Retrieved 19 July 2014. ^ "Rajamouli goes digital for Bahubali". The Times of India. 26 June 2014. Retrieved 19 July 2014. ^ "'Baahubali' movie release date". IndiaGlitz. 17 June 2014. Retrieved 23 June 2014. ^ Tsering, Lisa (13 July 2015). "'Bahubali': Film Review". Retrieved 1 August 2015. ^ McCahill, Mike. "Baahubali: The Beginning review – fantastic bang for your buck in most expensive Indian movie ever made". the Guardian. Retrieved 1 August 2015. ^ "'Baahubali: The Beginning' Review: A Giddy Spectacle, If Somewhat Uneven". The Huffington Post. Retrieved 1 August 2015. ^ "Busan: Final 'Baahubali' Aims to Be Bigger, More Emotional". Variety. Retrieved 22 October 2015. ^ "Sitges Film Festival » Baahubali – The Beginning". sitgesfilmfestival.com. Retrieved 22 October 2015. ^ "BAAHUBALI : THE BEGINNING | Utopiales • International Festival of science fiction of Nantes". www.utopiales.org. Archived from the original on 31 January 2016. Retrieved 10 November 2015. ^ "2015 台北金馬影展 Taipei Golden Horse Film Festival | 巴霍巴利王：創始之初". www.goldenhorse.org.tw. Retrieved 10 November 2015. ^ "Baahubali: The Beginning — Special Screenings — Black Nights Film Festival Nov 13 - 29 nov 2015". 2015.poff.ee. Retrieved 13 November 2015. ^ "L'Étrange Festival — XXIe édition — Du 3 au 13 septembre 2015 - Baahubali: The Beginning". www.etrangefestival.com. Archived from the original on 5 March 2016. Retrieved 6 December 2015. ^ "Festiwal Filmowy Pięć Smaków — Bahubali: Początek". www.piecsmakow.pl. Retrieved 6 December 2015. ^ "Baahubali To Be Screened At Brussels International Fantastic Film Festival". FitnHit.com. ^ "BAAHUBALI-THE BEGINNING - 2015 HIFF Fall Festival". program.hiff.org. Archived from the original on 17 November 2015. Retrieved 15 November 2015. ^ "Baahubali: The Beginning team heads to Cannes". The Indian Express. 9 May 2016. ^ "'Baahubali' nominated for Saturn Awards in five categories". The Indian Express. 27 February 2016. ^ "Baahubali 2 honoured again, to open Moscow International Film Festival". www.msn.com. Wikimedia Commons has media related to S. S. Rajamouli. This page was last edited on 11 April 2019, at 09:30 (UTC).